HomeResourcesTube Amp vs. Solid State | AMP TYPES! Tube Amp vs. Solid State | AMP TYPES! Grab a snack, sit back and relax because..
You’ve come to the right place!! Does your headphone need an amp? Now without further ado, let’s get rolling! I never knew there was a such thing as a headphone amp, even just a few years ago! Once I got my feet wet in the audiophile world, I realized what an endless amount of possibilities there are. There are so many different types of headphones and amps, that it can become overwhelming at times. I do my absolute best here to give you concise reviews and comparison reviews. My goal is to narrow down options and come to a Consensus on what is best, what’s good, and what’s bad. I always ask that you let me know if I miss the mark! 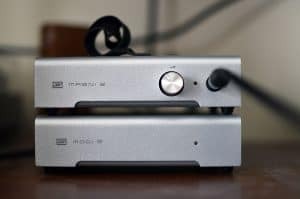 With headphone amps, it can be very difficult to come to a solid conclusion on which headphone is best suited with a particular amp. There are a ridiculous amount of them on amazon these days! Luckily, there are a select few out there that are consistently sought after and given high marks. Most of the ones I recommend are Solid State, and can be found on amazon. Tube amps are the other type, and they are generally reserved for those super nerdy audiophiles. You know, the kind that attend Head Fi meets? Lol I actually do want to attend one of those at some point 😛 But onwards my boy! These are the ones that are less likely to be found in abundance on amazon. I’ve seen some, but the vast majority of these babies appear on manufacturers websites, or some obscure site you may happen to land on in your search. Higher distortion than similarly priced solid state amps. Roll off at the limits of human hearing frequencies. Tube amps are basically meant to “color” the sound in a very pleasing way. Even though they do tend to have more distortion, the characteristic can be very pleasing. It gives a nice texture to music that sounds very rich, warm, full, and smooth. A tube amp also kind of “rolls off” the higher and lower frequencies, rather than having them just come to a rough stop. Some modern tube amps are actually being designed to mimic that of a more neutral, solid state amp. Another interesting thing that many audiophile geeks do is change the tubes inside the amp, thus changing the sound to their liking. This has almost become a hobby in and of itself! There are tubes out there that take the amp to a whole new level, breathing new life into old music. As far as build, a tube amp is a lot more fragile due to the nature of vacuum tubes and the high voltage that the circuitry uses. Some people say they are easier to work on, but are less stable and have more frequent problems. Others claim that they are actually very durable and can last a lifetime given proper care. It may be the wax capacitors that wear out rather than the other components. A capacitor is just a device used to store an electric charge if you were wondering! At the end of the day, there will always be differing opinions on each. There are situations when tube amps hold up longer than solid state amps, and vice versa. To go into further detail, all of this stuff relies upon each-other, so much so that any change in these 4 components will have an effect on the overall sound. It really is an art form! As mentioned earlier, headphone nerds love to change stuff. The easiest stuff to tinker with here are the tubes and bias. Some will swap out components. But only the super geek will alter the actual design of the amp itself. Computer/laptop —> DAC —> Amp —> Headphone. This is a relatively simple way of illustrating it. Most amps need a digital to analog converter so that your brain can make sense out of the numbers. It functions much like an audio interface. The sound is a jumbled mess until it is converted to a signal that we can process. This signal is meant to be of a much higher quality than your standard built in DAC that comes with your laptop or CPU. More about Bit depth vs. sample rate, and how your CPU processes sound! Solid state amplifiers are said to be more neutral, and aim to reproduce the music as accurately as possible. They by contrast are said to be a lot more stable than tube amps, but are harder to tweak and modify by the user. Again, some will say the opposite. It really does come down to a matter of preference as well as raw experience. As far as solid state, in the end it may be cheaper to just replace the amp altogether than go through the hassle of repairing it. They are also a lot more affordable, and are perfect for enthusiasts just starting out. I’ve seen the Magni/Modi combo endorsed so many times that I feel it’s almost mandatory to include it in any discussion or article that I write related to this stuff! It really depends on the impedance rating, but isn’t always indicative of whether or not you need one. For instance, the AKG K701 and K702 both have impedance ratings of 62 Ohms. Generally the lower the rating, the less likely you will need to invest. Some people simply won’t buy one even if it is recommended, because they would rather try out the headphone for themselves first. This is a valid stance. You can always add one later if need be. How to choose a headphone amp! Ah, the fun part. I won’t really go into headphones specifically, but I will say that anything with a 250 Ohm rating and above almost requires separate amplification. Some would argue that a lot of impedance ratings below 250 require one, A lot of people claim the 300 Ohm Sennheiser HD 600 sounds just fine from a standard headphone jack or portable device! I suppose it depends a lot on the headphone itself, as well as your ears and preferences. Schiit Magni/Modi combo. One of the most recommended for entry level enthusiasts. JDS Labs 02. A more underground amp that really delivers. Fiio E10K (combo). This one is used a lot with the Sennheiser HD 598, an amazing open back headphone. Should you buy the Sennheiser HD 598? Bottlehead Crack. It’s an OTL (Output transformerless). This one is used a lot with the HD 600 and 650. It’s great for enthusiasts wanting to get their feet wet with a DIY project. It also does extremely well with a wide variety of headphone models! Check out my Sennheiser HD600 Review! What is the Sennheiser Veil? Tyll Herstens, a really knowledgeable and seemingly great guy has a sweet article on The Marvelously Addictive Bottlehead Crack! He also goes into listening tests with the Woo Audio WA2. Schiit Valhalla 2. Pairs great with the Beyerdynamic T90, and also makes a good upgrade from the JDS Labs 02 (mentioned above). More neutral, and reproduce the sound accurately. Perhaps a little more cold, lifeless to some (only a small majority of Solid state amps are like this). Warmer, lusher, more inviting. Colors the sound more. They also have high and low end roll off, rather than sudden/harsh dips. Reduces sibilance on headphones like the H800 quite a bit! A lot more customization. It’s far less risky to take one of these apart or switch out some components. Tube rolling is the most common way of changing the sound up a bit. Some say more fragile, others disagree and claim that with proper care, tube amps can last a lifetime! DIY. The Bottlehead Crack is a fully do it yourself project, which is perfect for getting your feet wet. Well my friend, that’s about it for today! I hope you’ve come away with some newfound insight on Tube amp vs Solid state, and have a better idea of the differences in each. Which type of amp would you be more likely to go with, and why? Let me know!! If you have any other questions, or feel like I left out something, please leave a comment down below or Contact me! Did I get something wrong? Tell me. I would love to speak with you! Be sure to check out my Reviews and Resources page for more helpful and informative articles! What is a cardioid capsule? | All about microphones! How to sample in FL studio | using the MPD 18! Acoustic Sound Treatment | SOME TECHNIQUES! Stu is determined to provide the truth about all things audio, and strives to deliver excellent content to you the reader! In his spare time, he likes to fish, paint, play guitar, attend church, take photos, record videos, graphic design, and more. His attention to detail and perfectionist attitude are what allow him to excel, but it can be both a blessing and a hindrance at times. A fascinating post on the world of amps. I learned more reading through your post than I expected. The new technology and old technology with a twist (vaccum tubes) that is now around and available is amazing! Admittedly it has been some years since I was crazy about the possibilities of enhancing my music to hear what I expected and strived for. Life and a family pulled me away from that world. Thanks for updating me as to what is out there now for lovers of pure sounds of music. I will jump over to some of the many links you most graciously have provided to dig deeper, so mission accomplished on your part! You have me once again excited about the sounds I listen to…Bose, I love them, I have 3 setups in my place iin Germany. But I know there is more to squeeze out of the sounds and this has me interested in seeing what direction I can go…Thanks! No problem Dave and glad to help! I’ve been learning so much about headphones and music with this site as well. It’s hard to believe how much gear there is. Sometimes it can become overwhelming. I try and narrow it down considerably before making recommendations.. I was just about to go with a solid state amp but now I’m really considering taking the plunge with a tube amp! Please stop back by anytime! Wow, very interesting post on the world of amps. Itâ€™s been years since Iâ€™ve bought an amp I still have my Crate amp which is a solid state amp. I didnâ€™t even know they still made Tube amp. I remember Mesa boogie was a big maker of Tube amps when I played, however was very pricey. And as your post stated the reliability factor is much lower than the solid state counterparts. However it all depends who you ask which do they prefer you get a bunch of different answers which produces the best sound. I agree that Tube amps produces warmer sound, however my solid state amp has more options as far as producing different types of sounds. What kind of sounds can you get out of your solid state? I think a tube amp is a valuable option for a headphone that suffers from sibilant/harshness, such as the HD 800. Solid state is a great option if you’re just getting your feet wet though. Mesa Boogie? Lol I’m gonna have to check that out, thanks! Stop back by anytime as well. Audioquest Dragonfly Red vs. Chord Mojo vs. Oppo HA-2 | An Upgrade In Sound? ifi xDSD Super Charged Review | Jam Packed With Everything You Need? FiiO Q1 MK II Review | Does It Have Enough Power? EmmaKings on Presonus Eris E5 vs. JBL LSR 305 | KEY DIFFERENCES? Omer Yasin on HIFIMAN HE400i Review | INTIMATE! Stuart Charles Black on ifi xDSD Super Charged Review | Jam Packed With Everything You Need? Stuart Charles Black on HIFIMAN HE400i Review | INTIMATE!